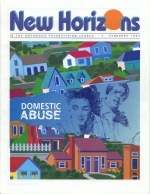 Domestic Violence: What's the Church to Do? Imagine yourself watching a "real life" police show. In the first clip, police officers, responding to a 911 call, enter the small wood-frame home of Zach, 45, and Elizabeth, 40. He is slightly built and balding, and has a beer belly; she is frumpy, weary, and worried. Two boys, ten and eight, run around the small house in their underwear. Zach, an unemployed logger, spends his days watching sports on TV, drinking, and yelling at everyone. Elizabeth, who works part-time to help financially, fearfully tries to make everything perfect in order to avoid Zach's wrath. Five years ago, Zach threatened to beat the boys severely, and when Elizabeth intervened, he slapped, hit, kicked, and spit on her. Zach's remorse consisted of banging his head against the wall until he bled. He has never hit her since, and figures that making holes in the wall is better than hitting her. Tonight his drinking and threats, including throwing things, triggered her fear and she called 911. She is packing to go to a battered women's shelter.